Andy Dowie says Queen of the South can upset Rangers in the play-offs, but only if the Ibrox side are not at their best over two legs. "We know we will have to be at our maximum to get anything. If we do that, it depends on what Rangers bring," the 32-year-old defender told BBC Scotland. "If we play to our maximum and so do Rangers the likelihood is Rangers will win the game. If Rangers have an off-day, we need to take advantage." Queens host the first leg on 9 May. 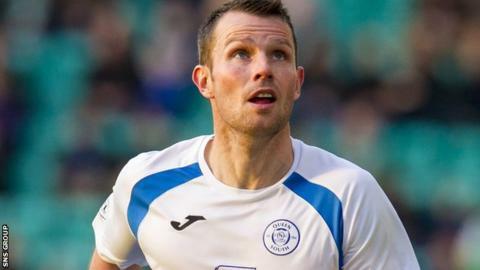 Dowie, who moved to Palmerston Park in the summer of 2013, has agreed a new one-year deal with the Dumfries side following recent extensions for Chris Higgins, Derek Lyle and Iain Russell. "The manager has done a fantastic job since taking over and it was an easy decision," he said of Queens boss James Fowler. And Queens can take heart from an excellent record against Rangers this season. In their two league matches at Palmerston, they have beaten the Glasgow side 2-0 and 3-0, while they earned a draw at Ibrox in March. "We know it's going to be very difficult, but we definitely have a chance," added Dowie. "We've shown that we are more than a match for Rangers on our day. "I don't know how much bearing those previous results will have, but it does give the boys confidence. "We've got good individual players, but we are very much a team first and foremost and we work hard for each other. "That's been the secret of our success this season." Dowie was with Rangers for the first five years of his career, making just one first-team appearance. "I'd still say I was a Rangers fan, but, come the games, it doesn't really matter," he explained. "It's just another team you need to beat." This will be the central defender's second taste of the play-offs, with Queens losing out to Falkirk at this stage last season. "It's been a long time coming," said Dowie. "I think everyone agrees they should have been introduced much earlier. "You can see the excitement the play-offs have brought to English football."